(7/15/17) Team 5950 begins advertising for the off-season competition, MARS (Mid-Atlantic (Broadband) Robotics Showdown), that will be held at our home school, Tunstall High School, on October 7th, 2017. We hope to bring teams from all over Virginia and North Carolina to participate in this event. We will be hosting this event with alongside Mid-Atlantic Broadband. They are sponsoring this event in order to bring awareness to the opportunities robotics can hold for students. (6/25/17) The business team travels to the National Advocacy Conference in Washington D.C. to gain support for STEM education. The 3-day event was a huge learning experience involving tours of the capitol, meetings with senators, and advocating with other teams in the FIRST community. (6/23/17) Team 5950 teaches a class at the Summer Governor's School at Chatham High School. We held a hands-on learning experience with programming finch robots and ozobots. (Spring 2017) Team 5950 hosts our second annual pancake breakfast, along with our second annual trivia night. Both events were a success. We also host an ozobot/robot demonstration at the Danville Science Center. Many families stopped by and learned about FIRST robotics, along with programming ozobots and finch robots. (4/5/17) Team 5950 travels to VCU in Richmond Virginia to compete at the district championship. We started very well, ranking in the top half of teams, and drop to 46/58 at the end of the first day. At the end of the qualifying rounds, we ranked 19/58 teams. Unfortunately, we were not ranked high enough to become an alliance captain, and were not picked for any other alliance as well. Even though we did not advance to the finals, it was an amazing experience for the whole team, as this was our first time competing in our district championship. (3/24/17) Team 5950 travels to Deep Run High School in Glen Allen to compete in our second season event. We interviewed for the Chairman's Award, and our business captain, Justin Sherlock, interviewed for the Dean's List Award. Our safety captain, Nathan Evans, won the UL Star of the Day, his 3rd safety award. At the end of the qualifying rounds, we were ranked 16/37 teams. We enter an alliance with teams 3274 and 5546. Unfortunately, we lost in the quarterfinals. At the end of the day, we ranked 41/129 in our district, and win the Judges' Award! (3/3/17) Team 5950 travels to Blacksburg, Virginia, to compete in our first season event. We interviewed for the Chairman's Award, competed in several intense rounds, and our safety captain, Nathan, won the UL Star of the day safety award. We ended up #2 in the qualification rounds, and became an alliance captain with teams 1262 and 3939. Unfortunately, we lost in our tiebreaker match. As of 3/4, we are ranked 12/128 in our district. (2/21/17) Build season is over! Our robot is complete. We are able to: collect fuel from the hoppers and via a sweeper, score in the low goal, collect gears, and climb the rope! (1/7/17) Kickoff Day! Over the next 6 weeks, we plan and build an elaborate robot, capable of performing tasks in the 2016/2017 games, FIRST Steamworks! (11/5/16) Team 5950 competes in the off-season competition, Rumble In The Roads. We end the day ranked 10th, with a 4-2-0 ratio win-lose ratio. We made it to the quarterfinals, but unfortunately did not continue in the tournament. (Fall 2016) Team 5950 continues to fund raise and visit schools around the county. We work registers at the Martinsville Race, pick grapes, and also have some fun bowling. We also start a FTC team at our local middle school. 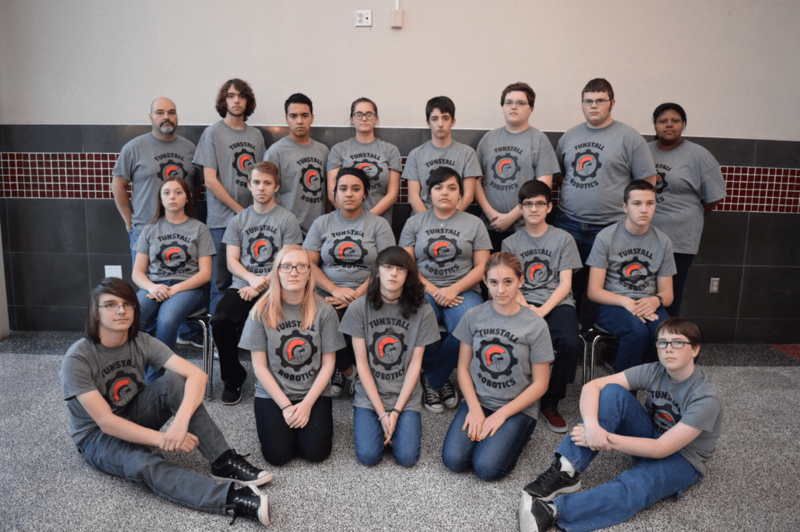 This team, 11422, performs very well in their first season, and makes it to the state championship in Lynchburg, Virginia. Multiple team members from 5950 helped mentor the FTC during their rookie season. (Summer 2016) During the summer, Team 5950 continues to focus on fundraising and community outreach. We hold a pancake breakfast, spaghetti diner, attend the STEM-H Summit, as well as visit schools in our area. (4/8/16) FRC Team 5950 travels to College Park, Maryland, to compete for the Rookie All Star Award. The interview goes very well and we were able to give clear answers to their questions. We cheer for the STAGS for the rest of the day. Unfortunately, we do not win the Rookie All Star Award. Although we did not win, the competition was an amazing experience and everyone had fun. (3/11/16) FRC Team 5950 competes in Blacksburg, VA and ranks 17/39 teams. We make it to Quarterfinals before losing by a few points. We are awarded the FRC Rookie All-Star award and the Highest Rookie Seed Award. Founded this year and headed up by Teachers Ed Sherlock and Jessica Jones, Team 5950 is finding its home and racing to put together a competitive team in our first year in the FRC division ever. This monstrous task would be even more difficult if it were no for the help of our gracious neighbors, the Martinsville STAGS Team 1262, with their help we are learning what it takes to make an FRC team. This marks the end of the very successful FTC robotics team at THS. However the end of the FTC division team left a vacancy that would soon be filled by an FRC division team- 5950!! This year's competition was titled "Bowled Over". Tunstall High School's FTC Team 3510 participated in the Shenandoah Valley Qualifying Tournament held in Charlottesville on January 28th, 2012. The team performed well, earning a spot at the FTC Virginia Championship tournament. The FTC Virginia Championship tournament was held in Richmond on March 3rd, 2012. During the Championship tournament, FTC Team 3510 advanced to the semifinals and participated with two other teams as the second seed alliance team. The alliance went on to win the Piedmont division and advanced to the finals. At the end of the day, THS Robotics Team 3510 finished as part of the second placed alliance team at the Virginia State Championship Tournament. The Rockwell Collins Innovate Award celebrates a team that not only thinks outside the box, but also has the ingenuity and inventiveness to make their designs come to life. This judged award is given to the team that has the most innovative and creative robot design solution to any or all specific field elements or components in the FTC game. Elements of this award include elegant design, robustness, and 'out of the box' thinking related to design. This award may address the design of the whole robot, or of a sub-assembly attached to the robot. The creative component must work consistently, but a robot does not have to work all the time during matches to be considered for this award. This judged award is given to the team that best reflects the journey the team took as they experienced the engineering design process during the build season. The engineering Section of the Engineering Notebook is the key reference for the judges to help identify the most deserving team. The team's Engineering Section should focus on the design and build stage of the team's robot. Journal entries should include those describing the underlying science and mathematics of the robot design and game strategies, the designs, re-designs, success, and those interesting moments when things weren't going as planned.